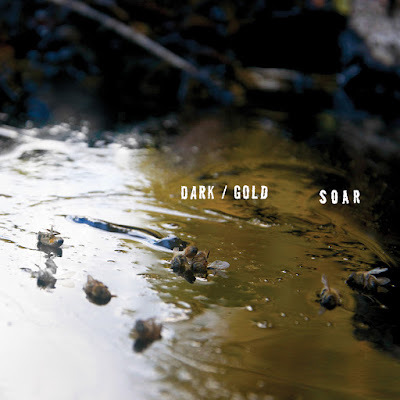 Stream the upcoming tape from Bay Area group SOAR. SOAR was born out of the special desire to create something with people you can relate to and learn from. Members of Bay Area bands Joyride, Watercolor Paintings, Void Boys, and Dreamspoiler have come together once again to create their second tape, dark/gold, a set of earworms to help you cope with the inevitable ending of summer. Upon the opening of the first song, “Fort Funston,” you can immediately tell this is purely a group effort, with multiple layers of vocals and the juxtaposition of harsh guitar feedback on top of soft melodies. Hints of the jumpy Bay Area twee influence from bands like Crabapple and Sourpatch undoubtedly shine. “Secret Santa” in particular is guaranteed to get you to hit the “repeat” button. In the collaborative spirit of SOAR, I asked Mai, Rebecca, Shannon and Jenna some questions group-interview style. You can read it below and pre-order the tape from Father/Daughter here. The Le Sigh: Everyone in this band has previously played in bands that sound vastly different from each other. How do you think each band member/each of you contributes their own unique musical angle to the project? Mai Oseto: I think our different musical style is cool but I think what makes it all work is our personalities. We get along so well and we’re all comfortable contributing different things or suggesting new ideas. I like to add kinda screamy harmonies. Rebecca Redman: My job is to beg everyone to turn up the distortion and write parts that are sludgier. Shannon Bodrogi: I tend to write sort of long emotional pop songs, often inspired by nature and literature. Jenna Marx: I think when someone brings a song or a part of a song to practice we all write our own accompanying parts to it in the way we know how, so by nature each of our perspectives or angles is worked in somehow. I know for me because I have never had lessons, I really only know how to play what I’ve already learned on guitar, and with each new project I’m a part of my personal style grows, so I feel like even just in my guitar parts I can hear things that remind me of my other bands and the people I worked with in those projects. TLS: You have all put work towards the Bay Area Girls Rock Camp. Did that contribute to this band coming together to form? MO: Yes! Shannon and I met while volunteering at Bay Area Girls Rock Camp. We became a band a month or two after camp ended. RR: I haven’t actually taught at BAGRC, but I was the drum instructor for a while at the camp down in Santa Barbara. JM: Yeah! I think BAGRC / girls rock programs in general seem to inspire and motivate all of us because it’s such a special and empowering experience to work with young people and watch them create such amazing things. We first got together as a band after I put a call out to play music with non-cis male musicians because two of my former projects had disbanded and I was only playing with men at the time. The post was definitely BAGRC-inspired because it was just a couple weeks after summer session ended and I wanted to continue being around and working with femme and non-binary musicians. TLS: A theme I noticed lyrically throughout the album is friendship, which I think can be an even heavier topic than romantic relationships sometimes. What was it like bringing four different perspectives and sets of emotions to the table while writing together? RR: In this band, we all definitely value our friendship and positivity more than perfection. We aren’t trying to be the greatest or most successful band in the world; we’re just trying to write relatable songs that help us deal. We know how to compromise and we know when to speak up versus let things slide. I guess that mostly just means we’re adults. MO: We’re all good listeners. I’m always pretty nervous sharing personal lyrics but it’s gotten a lot easier with SOAR because we’re all very open and understanding. We make room for each other. SB: Also, we all knew and respected each other but we didn’t start out as good friends. We built these relationships over time, and over a creative understanding. Some of my best friends came into my life through art. Collaborative art is a mix of vulnerability, respect, and understanding. Friendship is a collaborative art. I think because we care about each other first, it shows in what we make together. JM: Yeah, what everyone else said! In terms of bringing our different perspectives and emotions together when writing there’s really not very much conflict around that. I feel like whoever writes the lyrics writes based on their own reality and experience and then we all get the opportunity to support that and contribute our own piece to make it into a song. Listen to SOAR on bandcamp. Alyssa Rorke is a Philly-based writer/artist/musician/barista. Find her daily musings on Twitter @poetrygirl420.